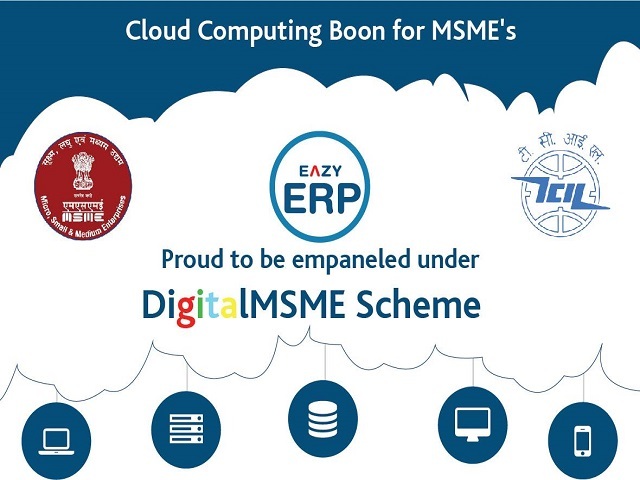 The pioneer of developing India’s first Tally Integrated ERP Solution, Eazy ERP, has declared its empanelment to deliver ICT services on cloud to MSMEs under the government’s DigitalMSME subsidy scheme. The official announcement was made amongst the presence of eminent personalities during ‘Annaporna – World of Food India’ trade fair at Bombay Exhibition centre. “Cloud Computing for ICT is fast emerging as an innovative technology and the launch of the DigitalMSME Scheme is sure to act as a catalyst for a positive transformation of the MSME Sector,” said Kunal Singhal, Managing Director, Eazy ERP. “The response at Annapoorna has been great. A lot of MSMEs have inquired about the DigitalMSME Scheme and have shown interest in availing attractive subsidy under the scheme. After looking at such a good response we are positive that we will successfully achieve our target of acquiring more than 1000 MSMEs in the first quarter,” he added. The DigitalMSME Scheme was launched by the Ministry of Micro, Small and Medium Enterprises (MSME) to mark the first International MSME Day on June 27, 2017 in New Delhi. The prime objective of the DigitalMSME Scheme is to encourage MSMEs to adopt ICT. Under the scheme the MSMEs with a valid Udyog Adhar Memorandum (UAM) number will be able to avail ICT on cloud at a subsidised rate. The Ministry will provide a subsidy of 60 per cent to MSEs under the scheme. The subsidy will be upto 60 per cent of the costs with a cap of Rs One lakh for two years. Furthermore, to make the MSME registration hassle free, all the processes to avail the scheme are online. Subsidy is only for MSE’s with investment in plant and machinery less then Rs Five crore. Eazy ERP is fostering upon making the vision a reality by undertaking various activities, workshops, and events to spread awareness about the scheme amongst MSMEs. The company is giving free handholding to these enterprises in order to avail the scheme.